Button batteries, especially big, powerful lithium coin cell batteries, can badly injure or kill a child if they swallowed and get stuck in the throat or gullet. Button batteries are small, round batteries that come in many different sizes and types. Lithium button batteries (often called ‘coin batteries’) are most dangerous as they are larger and more powerful. If they get stuck in a child’s throat, they can cause catastrophic internal bleeding and death within hours of being swallowed. Most button batteries pass through the body without a problem. But if a button battery – particularly a lithium coin battery, gets stuck in the throat or gullet, energy from the battery reacts with saliva to make the body create caustic soda. This is the same chemical used to unblock drains! This can burn a hole through the throat and can lead to catastrophic internal bleeding and death. The reaction can happen in as little as two hours. All batteries pose a risk to children but the size and power of button batteries and the size of the child matter. With a large, powerful lithium coin cell battery and a small child, the risks are greatest. It’s not just fully charged button batteries that pose a risk. Modern devices need a lot of power. When power levels drop, we think the battery is flat and discard it. But it can still have enough electrical charge left to badly injure a child. At least two children a year have died as a result of swallowing button batteries in this country. We don’t know how many children are taken to A&E, admitted to hospital or suffer life-changing injuries. Children most at risk are between 1 and 4 years, but younger and older children can also be at risk. The personal story of a father, George, from Hampshire whose toddler Francesca sadly died after swallowing a button battery. Where can you find button batteries? Button batteries are used in an increasingly wide range of toys, gadgets and other everyday objects you’ll find around the house. Lots of these objects have buttons and surfaces that young children love to explore and play with. Many are brightly coloured or otherwise appealing to children. In the UK, batteries in children’s toys are covered by toy safety regulations. They should either be enclosed by a screw and a secure compartment, or need two independent or simultaneous movements to open the battery compartment. But remember that older children may still be able to open secure battery compartments. But toys bought online or from markets, discount stores or temporary shops may not follow the appropriate safety regulations. For example, trading standards officers have issued warnings about light-up fidget spinners where the battery is easily accessible to children. What situations have accidents already happened in? A product is dropped and the battery falls out. A battery is ‘flat’ and has been taken out and left on a worktop or table. A packet of batteries is opened and the batteries spill out under the sofa or a cupboard. Spare batteries are stored in an easy-to-reach drawer in the lounge or kitchen. The button battery compartment of a toy or other device isn’t secured. How can I keep children safe? Keep all spare batteries out of children’s reach and sight, ideally in a high-up, lockable cupboard. Keep products with batteries well out of reach if the battery compartment isn’t secured with a screw. Teach older children that button batteries are dangerous and not to play with them or give them to younger brothers and sisters. Remember that even used batteries can be dangerous, so recycle them safely. The website of the British and Irish Portable Battery Association (BIPBA) has advice on the risks for parents and medical professionals – http://buttonbatterysafety.com. 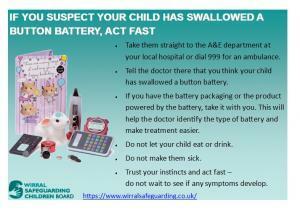 If you suspect that a child has swallowed a button battery seek urgent medical assistance.